Wabash senior quarterback Russ Harbaugh (Evansville, IN/Bosse) has been named the 2005 Mike Gregory North Coast Athletic Conference Offensive Player of the Year. The 6-1, 189-pounder led the Little Giants to a 10-0 regular season record and perfect 7-0 NCAC mark to claim the conference crown. He owned nearly every top passing mark in the NCAC this season, leading the league in passing yards (3,324), total offense (3,322), passing TDs (29), and passing efficiency (176.3). Harbaugh set conference record for single game passing completion percentage with a 19-for-20 effort in the Little Giants' 52-0 win over Denison. 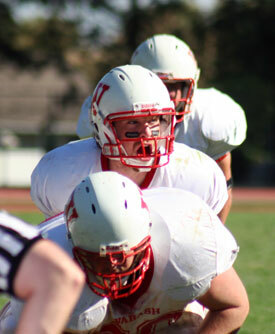 He also broke the NCAC mark for single season passing set by Denison's Greg Neuendorf (3,306 yards in 2001). Harbaugh is 18 completions away from breaking Neuendorf's single season record of 271 set in 2000. The senior also spent the year rewriting the Wabash College record book. He became the first Little Giant quarterback to throw for 3,000 yards in a season, passing the plateau with his 360-yard effort in a 38-20 win over Albion in the first round of the NCAA playoffs. He goes into the second round of the playoffs against Capital with 252 completions in 351 attempts for a completion percentage of 71.8. He has also thrown 29 touchdowns with only four interceptions in 11 games. Through ten games he ranked ninth in the nation in passing efficiency and 17th in total offense. 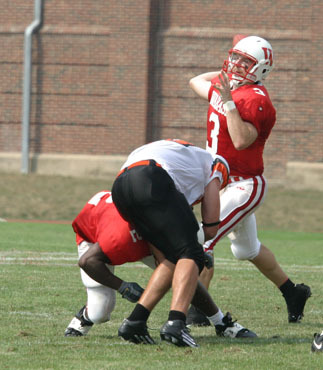 Harbaugh is currently third on the all-time Wabash passing list with 6,829 yards and in pass completions (254). He is second in career TD passes (56). Harbaugh is the second Wabash player to receive the Mike Gregory Award. Jake Knott '03 won the honor in 2002. His head coach, Chris Creighton, also won the award in 1989. The NCAC Offensive Player of the Year Award is presented by Mr. Richard Gregory of Columbus in honor of his father, Mike, a multi-sport athlete at Denison in the 1920's.